This year, we've been booktalking to several 2nd and 3rd grade classrooms, which made transitional chapter books (chapter books aimed at 2nd/3rd graders) a must for one of our Reading Wildly meetings. 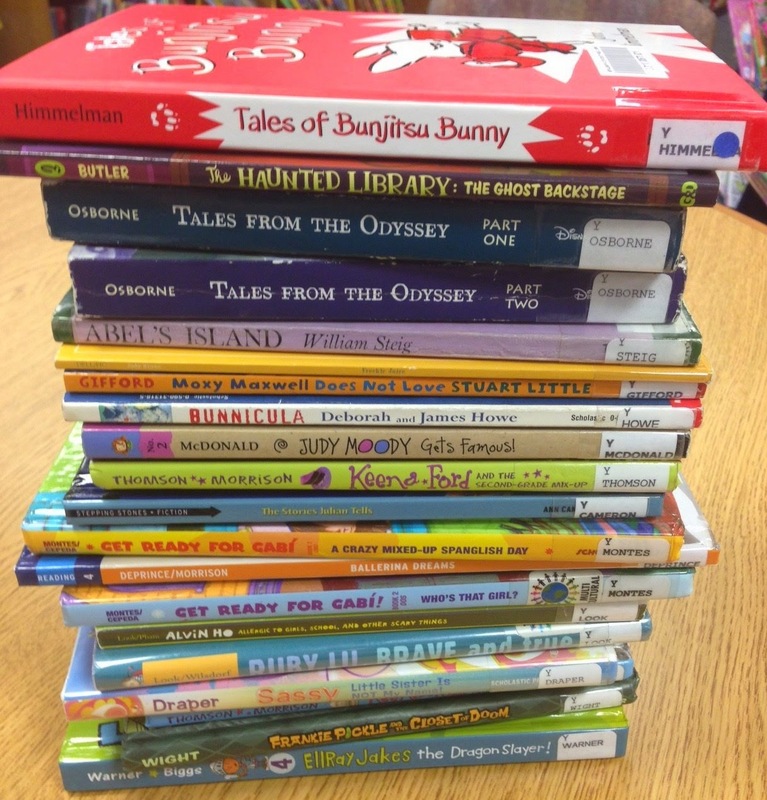 This month, we kicked off our exploration of transitional chapter books by talking about an "article". I printed out slide selections from the presentation A Missing Link in Closing Reading Achievement Gaps: Short Chapter Book Series with Primary Characters of Color by Sandy Carrillo and Jane Fleming. We discussed the importance of transitional chapter books in building fluency and reinforcing vocabulary. The slides mention that many early chapter book series deal with events and situations that are familiar to kids, which makes the stories easy for children to understand. And they often include a chapter or section to introduce the setting and characters to the reader, setting the stage for the story. I think we heard about a great variety of stories that will be good to share with those 2nd and 3rd grade classes we're visiting. Next month, we'll be discussing mystery books, which is definitely a genre I do NOT gravitate toward (so a month that will be especially good for me!). What are your favorite middle-grade mysteries?